Each year, TALB is honored to recognize members, administrators, and community supporters for their outstanding performance and contributions to education. Award recipients are presented at our annual TALB Award Dinner held in June. We believe our annual awards are even more significant because nominations are made directly by TALB members. Any TALB member may submit a nomination for a TALB Award. The Golden Apple Award recognizes K-12 TALB members that have earned the respect and admiration of their colleagues. TALB members may submit nominations for this award by completing this form and writing a Statement of Support. Must be a K-12 teacher, nurse, librarian, facilitator, or specialist. Must demonstrate dedication towards the children, staff and co-workers, and parents. Must exhibit awareness, understanding, and respect for cultural and family diversity. Receive at least (3) THREE nominations (at least two from fellow TALB members). The Golden Star Award recognizes CDC/Head Start TALB members that have earned the respect and admiration of their colleagues. TALB members may submit nominations for this award by completing this form and writing a Statement of Support. Must be a teacher in the Child Development Center or Head Start program. Must demonstrate dedication towards their CDC/Head Start program, the children, staff and co-workers, and parents. The TALB Membership Award recognizes a TALB member that has demonstrated outstanding contributions to the Association and the community. TALB members may submit nominations for this award by completing this form and writing a Statement of Support. Must be engaged in TALB membership activities. Must exhibit professionalism and demonstrate leadership in the Association. 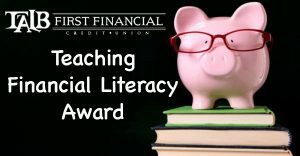 The Teaching Financial Literacy Award recognizes (3) three Long Beach educators who have taught financial literacy to their students. Examples may include elementary teachers that have found a creative way to teach students how to count money; middle or high school teachers that have taught students how to balance a check book; teachers that show students how to manage income, pay expenses, save money, and/or use credit cards responsibly. Award recipients will be presented with a distinguished plaque at the annual TALB Parking Lot BBQ on California Day of the Teacher and also at the annual TALB Unity Celebration awards banquet held in June. Deadline for nominations will be announced. All TALB members are eligible. Members may nominate themselves or fellow colleagues.